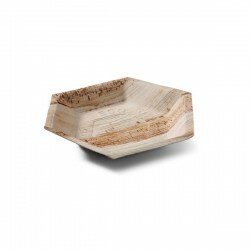 Palm leaf tableware are typically used in special events like historical reenactments, for packaging dried foods, baked goods, cheeses, and in all those cases where you want the service is truly unique. White cup made of solid cardboard hot combined with bioplastic film. Suitable for coffee and tasting. For hot and could beverages. Sturdy, suitable to contain liquid food. It is completely biodegradable and compostable . It has an excellent degree of transparency and brightness. It keeps the organoleptic characteristics of the product and it doesn't alter its taste and flavor. Sturdy and of attractive appearance, suitable for all occasions, full meals, buffets, catering and for take away. Cup ø10 x h6 cm biodegradable and compostable. Italian professional product in cardboard coupled with bioplastic film. Can be closed with lid cod. S80-1. Food cup takeaway resealable 500 ml, biodegradable and compostable. Italian professional product in cardboard coupled with bioplastic film. Havana color.